U.S. 13 is the primary north-south route serving the Delmarva Peninsula Beach Hampton Roads, Virginia and Sussex County, Delaware. Through Maryland, U.S. 13 passes through southwest Worcester County to Pocomoke City, where its branch route U.S. 113 begins. U.S. 113 arcs northeast toward the coast through Snow Hill while U.S. 13 turns westward across the Pocomoke River into Somerset County. Staying rural, U.S. 13 (Ocean Highway) meets Maryland 413 near Westover, where the four-lane highway curves back to the north ahead of Princess Anne. Initially traversing Tulls Swamp, Ocean Highway makes a long straight away northeast to enter Wicomico County ahead of Fruitland. 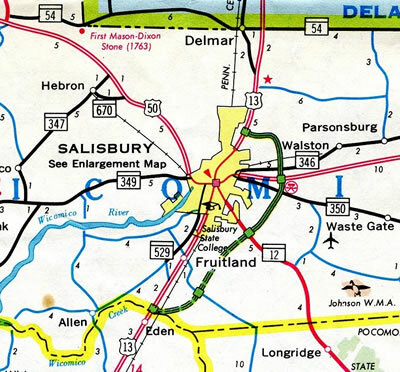 Through the Salisbury area, U.S. 13 splits with the mainline taking a freeway bypass to the east and a business route bisecting the largest city in the Maryland Eastern Shore region. The Salisbury Bypass also doubles as the U.S. 50 mainline around the northeast side of the city. U.S. 50 was added to the freeway after the extension west was completed in 2003. U.S. 13 otherwise rejoins its surface alignment (Salisbury Boulevard) by the Centre at Salisbury Mall. The U.S. highway exits the state north along a congested commercial arterial through the town of Delmar. 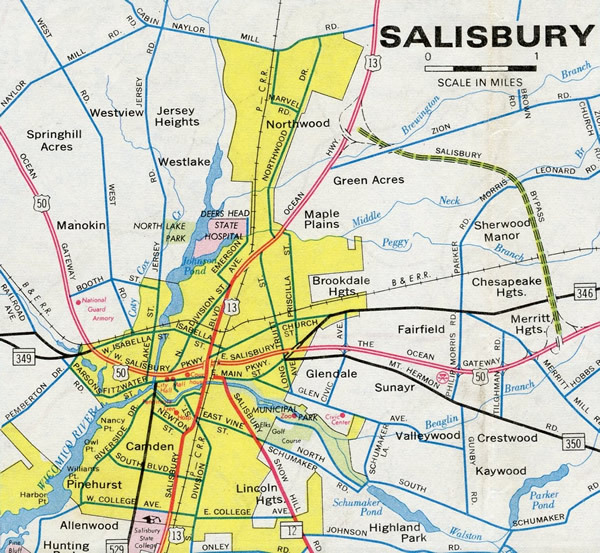 The western extension of the Salisbury Bypass under construction on the 2001-02 Official Maryland Highway Map. U.S. 50 shifted onto the Salisbury Bypass in 2003 while the former route through the city became U.S. 50 Business. Welcome to Maryland sign posted after Holland Road and the Accomack County, Virginia line on U.S. 13 north. Photo taken 07/28/13. A travel information center and rest area follow just beyond the state line. Photo taken 07/28/13. U.S. 13 curves through a forested area to cross Wagram Creek beyond the Worcester County rest area. Photo taken 07/28/13. Continuing north, U.S. 13 (Ocean Highway) reaches the Pocomoke City limits and approaches the separation with U.S. 113 (Worcester Highway). Photo taken 07/28/13. U.S. 13 bypasses Pocomoke City along a controlled access arterial to the east of Downtown. Forthcoming U.S. 13 Business follows the original route through Downtown. Photo taken 07/28/13. The Pocomoke City business route for U.S. 13 splits with U.S. 13 (Ocean Highway) from the left. Following Market Street through Downtown, U.S. 13 Business returns to U.S. 13 in 2.48 miles within Somerset County. Photo taken 07/28/13. Maryland 366 stems east from U.S. 13 Business to intersect U.S. 13 (Ocean Highway) at an adjacent intersection. Photo taken 07/28/13. U.S. 113 (Worcester Highway) branches northeast from U.S. 13 at the ensuing traffic light to parallel the Pocomoke River to Snow Hill. Photo taken 07/28/13. Maryland 366 totals 11.17 miles from Pocomoke City east to Goodwill, Stockton and George Island Landing off Parker Bay. Photo taken 07/28/13. Staying wholly within Worcester County, U.S. 113 north intersects Maryland 376 at Berlin in 28.08 miles and the exit ramp for U.S. 50 east to Ocean City in 29.33 miles. Photo taken 07/28/13. Motorists bound for the Somerset County seat of Princess Anne and University of Maryland Eastern Shore (UMES) are advised to remain along U.S. 13 after U.S. 113. Photo taken 07/28/13. Outside of the town of Berlin, U.S. 113 constitutes a rural highway for 37.49 miles to the Delaware state line north of Bishop. Widening of the last two-lane sections in the state will be completed by spring 2019. Photo taken 07/28/13. A bypass lane takes drivers directly onto U.S. 113 (Worcester Highway) north from U.S. 13 north. Overall U.S. 113 travels nearly equally between the Free State and First State, concluding in 74.45 miles at Milford, Delaware. Photo taken 07/28/13. U.S. 13 crosses the Wicomico County line on the one mile approach to the Salisbury Bypass. The U.S. 13 mainline bypasses the city along a freeway while U.S. 13 Business serves interests to Downtown. The bypass is the lone freeway segment between the Chesapeake Bay Bridge Tunnel and Dover, Delaware. Photo taken July 2002. Crossing over Maryland 350 (Mount Hermon Road), U.S. 13 north approached the cloverleaf interchange with U.S. 50 (Salisbury Parkway). Sign changes made here in 2003 reflected the U.S. 50 relocation onto the northern half of the Salisbury Bypass. The freeway was extended west to meet U.S. 50 northwest of the city while the former route town was redesignated as U.S. 50 Business. Photo taken July 2002. Zion Road spanned U.S. 13 north ahead of the original north end at Ocean Highway. U.S. 13 transitions onto a congested commercial arterial leading north to the twin towns of Delmar. Work completed here in 2003 extended the Salisbury Bypass another 3.8 miles west as the new alignment of U.S. 50. Photo taken July 2002. Traveling north through the town of Delmar, U.S. 13 (Ocean Highway) approaches Delaware 54 / Maryland 54 (Line Road). 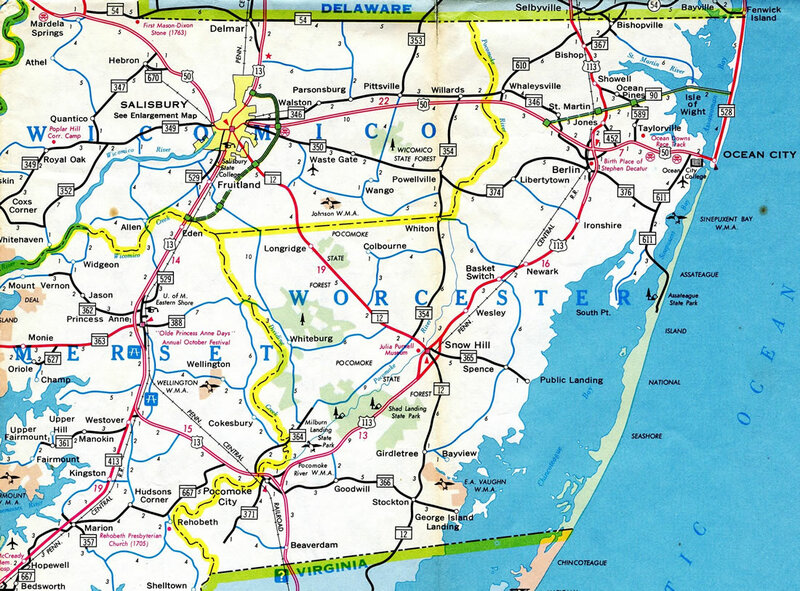 MSR 54 runs directly along the state border west to the Delmar, Delaware business district and east to Delaware 26 and Maryland 353 near Gumboro. Photo taken 01/15/17. Signed along U.S. 13 (Ocean Highway) north as Delaware 54, the state route west from U.S. 13 is maintained by MDSHA while DelDOT is responsible for the state route east to Brittingham Road. MSR 54 joins Delmar with Mardela Springs, Maryland to the west and with Selbyville and Fenwick Island, Delaware to the east. Photo taken 01/15/17. Entering Delmar, U.S. 13 (Ocean Highway) continues from the Delaware state line as a commercial arterial to the Salisbury Bypass. Photo taken 01/15/17. July 2002 by Jonathan Lebowitz.